When you’re a kid, building a Lego fortress that can withstand attacks from G.I. Joe and Transformers is a real accomplishment. 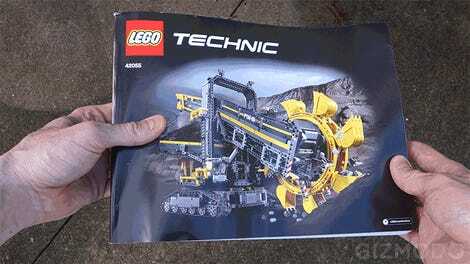 As an adult, you need a bigger challenge, and that’s what Lego’s 3,929-piece Technic Bucket Wheel Excavator set provides. It’s the most work I’ve ever put into building a toy, but the resulting edifice makes you feel like you deserve a job at Legoland. Lego’s Technic sets have grown larger and more ambitious over time, packing an incredible amount of detail into replicas of real-life vehicles. The Porsche 911 GT3 RS model even featured a working gear box. 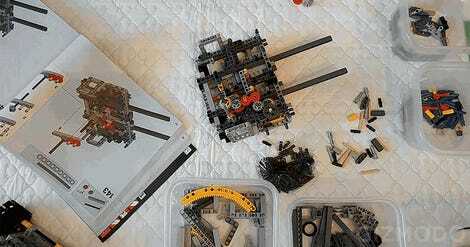 However, whereas the Lego Porsche is powered by you simply pushing it around, the Lego Bucket Wheel Excavator is motorized, with multiple moving features that drastically increase the building challenge. But the word ‘challenge’ doesn’t quite convey exactly what you’re in for when it comes to building the Lego Excavator. At 3,929-pieces it’s officially the biggest Lego Technic set to date. The box it comes in is massive, but the real scope of what you’re undertaking only becomes clear when you pull out the set’s 551-page instruction manual. I’m not even sure I’ve ever read a book that was this big. It’s highly recommended that you invest in some plastic containers for sorting pieces before you start building. All-in-all I spent roughly 20 hours turning the countless bags of semi-organized Lego pieces into the excavator model pictured on the box. Lego’s instruction manuals have always been clear and easy to follow, but that’s not to say that some steps weren’t challenging. The manual is easy to follow with clear illustrations, but you’ll still find yourself staring at a page while you figure out where every last piece goes. At times the excavator build can be easy, mundane, and even monotonous, with just a few pieces being added in each step. But other times you’ll find yourself spending 10 minutes hunting down pieces (a battery of plastic food storage bins are a must for sorting pieces) and then figuring out where every last one needs to go. Somewhere around halfway through the build I was completely sick of Lego, and my thumbs were raw from pushing plastic pegs into tiny Technic holes. But I carried on, and by the time I had reached the last pages of the manual, I was surprisingly proud of what I had accomplished. My greatest accomplishment in life. All of your hard work, aching thumbs, and bloodshot eyes leave you with an impressive miniature replica of the massive strip mining machines that dig away at the earth. Working tank treads are all but necessary to support this model’s weight. The Bucket Wheel Excavator rumbles along on a set of working tank treads that help spread out the Excavator’s weight. The real-life version is all but dependent on massive treads like this so that it doesn’t just sink into the earth, but Lego’s version is also surprisingly hefty given the 3,929 plastic pieces that went into its construction. That spinning excavating wheel looks ready to take a bite out of the earth. On the front you’ll find the excavating wheel itself, one of the model’s many motorized features, which spins to lift Lego rocks up onto the excavator’s moving conveyor belts. The arm supporting the spinning wheel can also be raised and lowered, using a manually-operated dial that extends a set of hydraulic arms. More tank treads, but here they’re used as conveyor belts to move Lego debris along. A pair of motorized conveyor belts then take those random bits of Lego scooped up by the excavating wheel and move them through the excavator. One of the belts can also be partly rotated from side to side so that the Lego debris can be eventually dumped into a tiny dump truck model that’s included with the set. 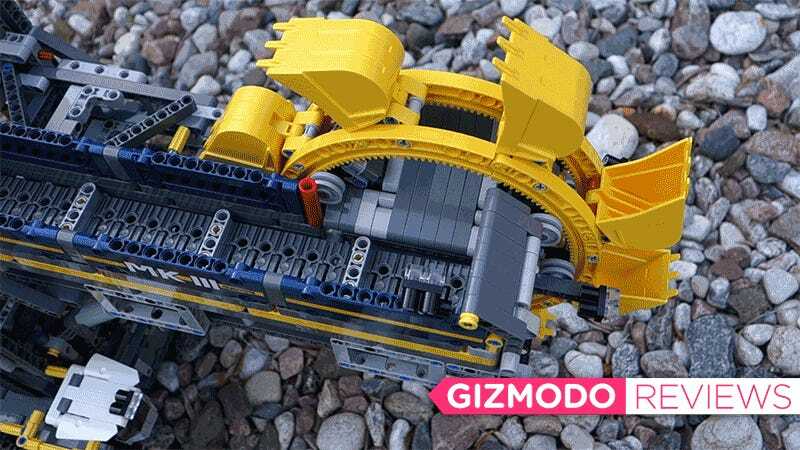 What’s most impressive about Lego’s Bucket Wheel Excavator isn’t just that it’s motorized: It’s that all of the moving features, including its ability to drive forwards and backwards, are powered by a single electric motor. Looking underneath the excavator at all of its gears almost looks more complex than peeking under the hood of your car. You’d assume there was at least a dozen motors powering all of the Excavator’s movement, but in reality there’s just one, selectively operating various functions using a complicated transmission and various gear boxes. 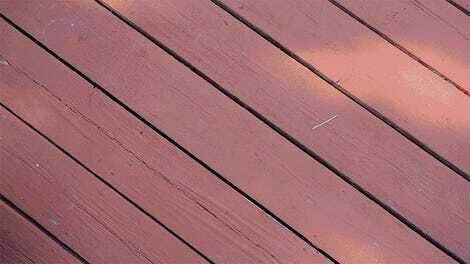 It reduces the number of batteries you need to power the model, but the downside of being dependent on a single motor is that all that gearing results in motorized functions that operate very, very slowly. The excavator in motion, sped up 80X. See this overhead shot of the Lego Bucket Wheel Excavator driving through the frame in about three seconds? That footage has been sped up immensely. In reality it took the model just over four minutes to roll across that short distance. It’s agonizingly slow, but that also helps sell the miniature scale of this Bucket Wheel Excavator since the real-life versions move even slower. It’s far from being a deal breaker, though. Half the fun of playing with Lego is the build itself, and the Bucket Wheel Excavator is, without a doubt, the most complicated Lego set you can buy today. You’ll hate yourself for even thinking about attempting it once you find yourself halfway through the build and compelled to finish it. But by the time you’re done there’s a wonderful feeling of accomplishment that you were able to tackle the biggest challenge from Lego’s designers. Twenty hours of building later, the Lego Bucket Wheel Excavator. Without a doubt, the most challenging Lego set you have ever built. Expect to lose many, many hours of your life while putting it all together, including going back to fix your mistakes. Your thumbs will be raw and sore by the time you attach the last piece, but it’s a satisfying soreness. At $280, it’s not a cheap set. Powered by a single electric motor which reduces the number of batteries you’ll need. The complex gearing that allows it to run off a single electric motor also means it runs very, very slowly. Can’t be used for actual strip-mining purposes.